I thought for two days about how to better express my own feelings about the concert in Sloviansk. After Mariupol – this is the first concert in the ATO [anti-terrorist operation zone]. In fact, even though I knew that the city has long been pro-ukrainian there were certain concerns. Once in the city, I realized that a renaissance had occurred in Sloviansk. But if suddenly, in the crowd of Ukrainian flags, a separatist appears, it will not be very comfortable for him to live in this blue-and-yellow city in eastern Ukraine. I want to return to this city again and play my music. I know precisely, that khuylo [swear word for Putin] will not make it to here. Why is it that a city in the East has become so Ukrainian? I think it is not because of the president or the Ministers, but thanks to the people living in Donbas, who feel themselves to be part of Ukraine, and not an appendage of a frenzied state by a President-halfwit. During the concert $3,800 Hryvnia were collected (50% goes to help the guys in the ATO from various battalions, and 50% – for staging my concert in Kyiv on the Anniversary of Maidan) [see below]. 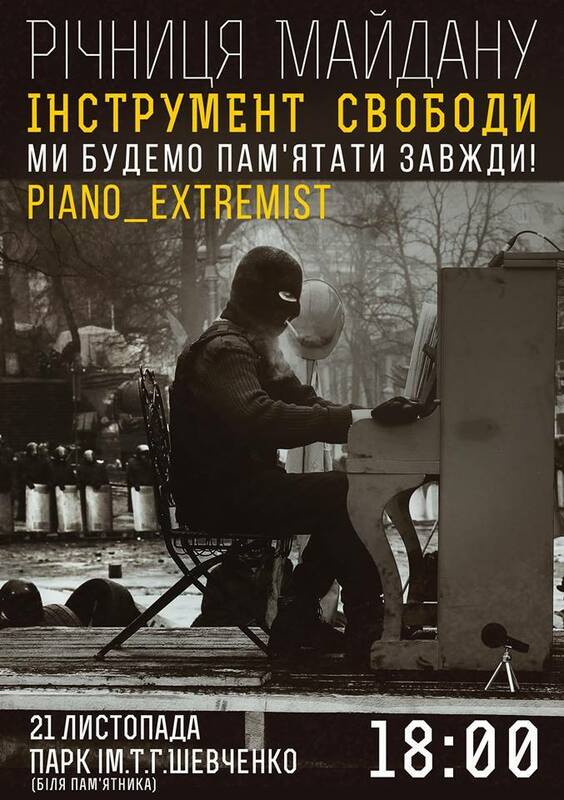 This entry was posted in "Voices" in English, Culture, English, English News, Help for ukrainian army, Maidan Diary, Music, Pictures, South&Eastern Ukraine, War in Donbas and tagged #RussiaInvadedUkraine, #Sloviansk, #UkraineUnderAttack, Piano Extremist, Revolution of Dignity, Ukraine. Bookmark the permalink.